The word diamond refers to the gems hardness (from the Greece words adámas and adamant which means “invincible” or “unconquerable”or “I tame” or “I subdue”). It is the reference for the hardness scale. However, its hardness does vary on individual crystal faces. Diamond is generally resistant to chemical attack (only chromic sulphuric acid at 200oC can change it to CO2). The genesis or forming of diamonds is not totally clear. Most scientist think that they were formed about 150 to 200 km below the surface at about 1,000 to 1,300oC with the carbon coming from either CO2, CO or CH4. They are carried to the surface with the rising kimberlite. 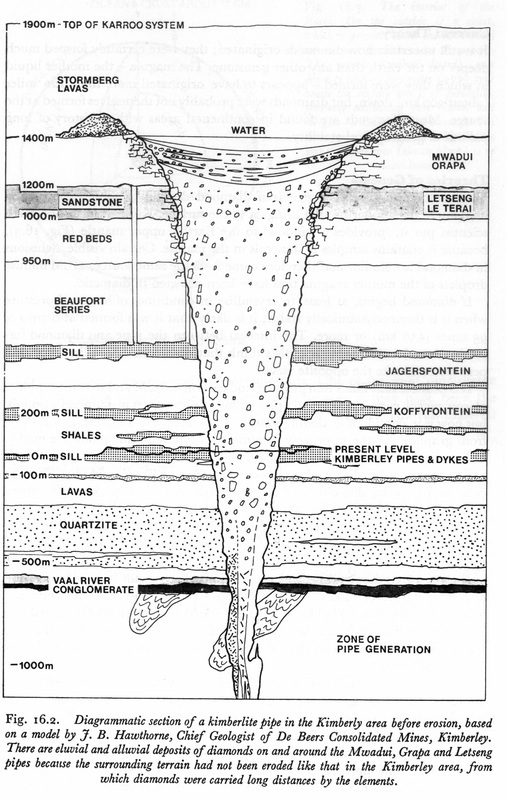 Kimberlite is found in three general forms: “Yellow ground” found near the surface, “blue ground” at deeper locations and “hardebank” a form that does not weather. The composition of kimberlite varies from place to place with olivine with serpentine being the most common and ilmenite, phlogopite, perovskite, magnetite and apatite often present. The diamonds are closely contained in the kimberlite rock but not attached to the rock as the kimberlite was only the transporter of the diamonds to the surface from where they were formed. The shape of the natural stone can be octahedron (eight sided), hexahedron (cube, six sided), rhombic dodecahedron (octahedron without corners), tetrakis hexahedron (boat shaped) and others including twin crystals. The processing involves crushing the ore and separating the diamonds by density in a high density fluid where the diamonds sink and the other material floats. In addition x-ray fluorescence is used to spot diamonds. There are many places in the world that process diamonds with the most famous being Antwerp. Now, Yellowknife has joined Amsterdam, New York, Ramat Gan, Johannesburg, London, Milan, Paris, Vienna and Oberstein as a processing location. The grading of diamonds is by color and clarity or inclusions, and of course the cut. Handouts will give information on these factors. Bauer, J. and Bouska, V. 1983. A Guide in Color to Precious & Semiprecious Stones. Chartwell Books, Inc.New Jersey, pp 80-83. Bronstein, A. and Hofer, S.C. 2000, Forever Brilliant, The Aurora Collection of Colored Diamonds. Ashland Press, New York, 89 p.
Bruton, E. 1978. Diamonds, second edition. Chilton Book Company, Radnor, Penn., 532 p.
Lyman, K. 1986. 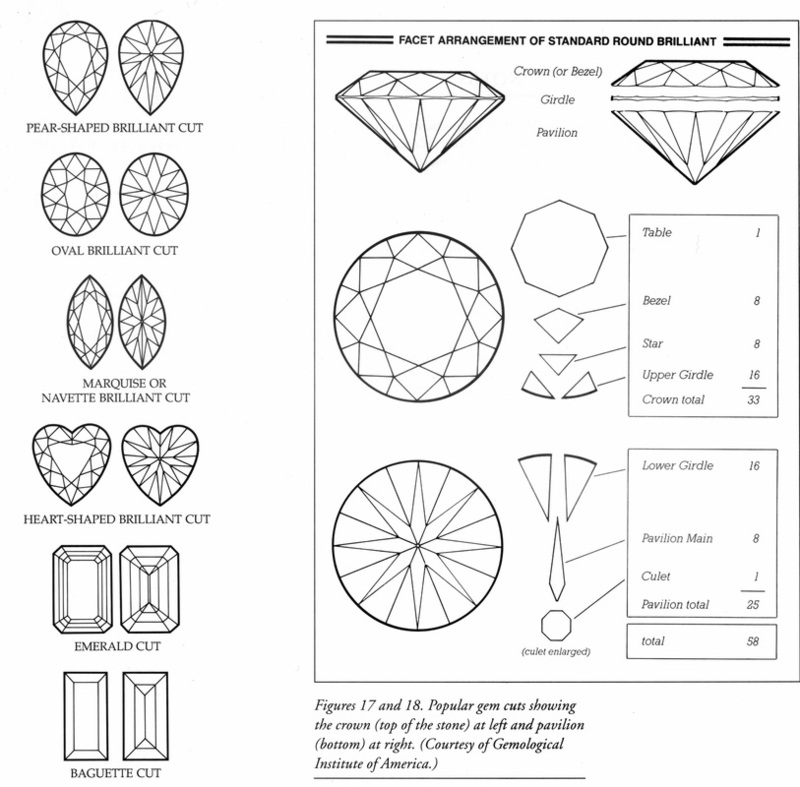 Guide to Gems and Precious Stones. Simon & Schuster Inc., New York, pp 74-89. Schumann, W. 1979. Gemstones of the World. Sterling Publishing Co., Inc., New York, pp 70-81.